I had been transporting a bottle from our home in Philly to our NJ cellar. And, right before the steps into the house, the neoprene bag I had this bottle of wine in slipped out of my hand and struck the hard concrete. Having dropped many a bottle before, I merely cursed my luck and bent over to pick up the evidence of my clumsiness. But then … it started to bleed … my precious bottle had started to bleed its beautiful fermented grape juice all over the sidewalk. I looked sown in horror … speechless … for a second not believing this was real, rather a horrible nightmare from which I only needed to awaken. 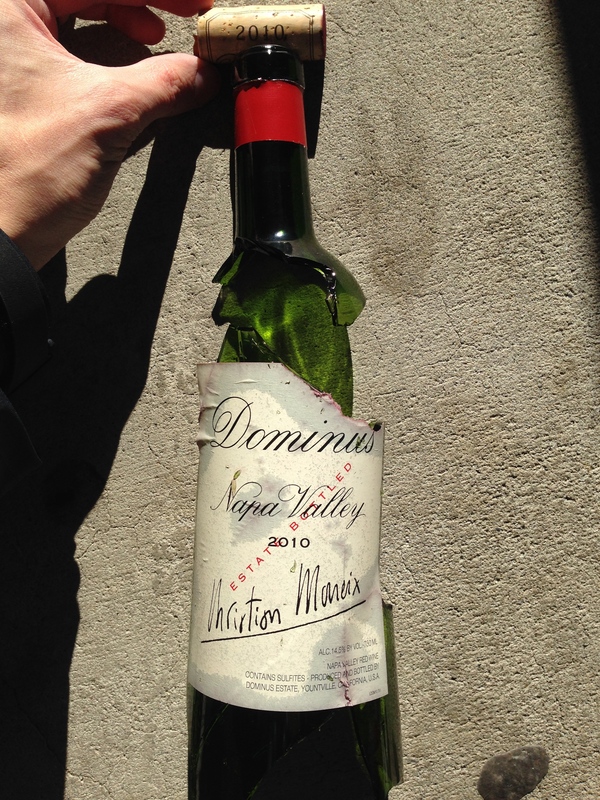 The emotions that filled me ranged wildly, from anger at my loss to frustration that I could have been so dumb to sadness, as Dominus is the g & t anniversary wine (we’ve been buying a bottle a year since we got married), and now it was gone. And after uber-critic Robert Parker re-rated the wine this past month to a perfect 100, it’s harder to find [at a reasonable price] than a needle in a stack of needles guarded by porcupines. I told you about how my butter-fingers caused a catastrophic loss of a bottle of wine. Forced to move on, I filled in the space in my cellar and deleted the bottle from my cellartracker. What’s done was done … or was it? This past weekend, sr and ha did the unexpected … they surprised me with a replacement. I’m not sure how they pulled it off, as neither really knows about wine, and, as I had mentioned, it had become “harder to find than a needle in a stack of needles guarded by porcupines” … I’m not sure how they did it, but they did (I imagine it would first involve a magnet to pull out the needles, and then some sort of high-speed optical sorter). So here’s a big online thank you to mom and dad! Thanks!